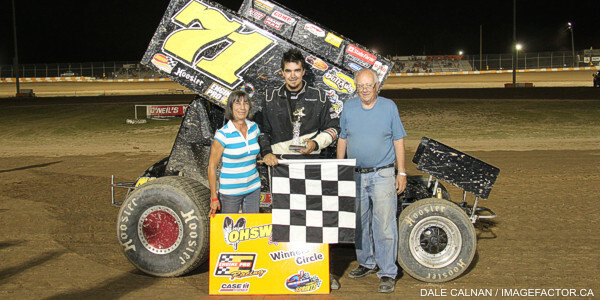 By Tommy Goudge (June 29, 2012) – Glenn Styres took his second Corr/Pak Merchandising Sprint Car win of 2012 on Friday night at Ohsweken Speedway. Metal Works presented “Kids Night” at Ohsweken, which also found Derek Wagner winning the Modified Lite Stars International Championship Tour feature, Brad Herron narrowly taking another Lighthouse Tattoos Thunder Stocks win, Karl Sault taking HRW Automotive Mini Stocks honours, and Jesse McDonald in the Engine Pro Racing Winner’s Circle for the Pierced Parts Bombers. 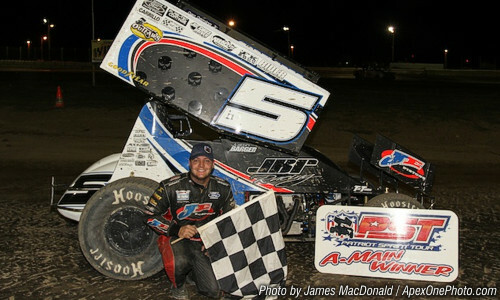 Chris Steele and Dave Dykstra started on the front row for the Sprint Car A-Feature, and Dykstra took the early lead, with Glenn Styres taking over the runner-up spot. Styres gave chase until lap 6, when he got around Dykstra and took the lead. Several yellow flags slowed the race, including one for hard-charging Jamie Collard, who was in the top 5 when a mud clod caused an issue with his throttle linkage. An entertaining race developed for the other top 5 positions, while Styres maintained his lead. Steele held the runner-up spot until just 5 laps were left, when both Tom and Jim Huppunen got by. Styres took the win, followed by Jim Huppunen, Tom Huppunen, Chris Steele, and Travis Cunningham. Heat races for the 30 car field were claimed by Jim Huppunen, Dain Naida, Glenn Styres, and Michael Parent, while Shane Ross won the B-Main. Jason Corless and Dillan Sliter began the Mod-Lite feature on the front row, but Derek Wagner quickly asserted himself up front. Wagner built a substantial lead until a caution flag flew just past the halfway mark for a Korey Howe spin. The stoppage allowed Paul Klager and Shawn Sliter to take a shot at the win, but Wagner did not make any mistakes, and took the win. Klager settled for the runner-up spot, followed by Shawn Sliter, Josh Sliter, and Dillan Sliter. Heat race wins for the 16 car field went to Josh Sliter and Shawn Sliter. Brett Rodwell and Robbie General started the Thunder Stock feature on the front row, and behind them the field quickly fanned out looking for racing room. Brad Herron and Cory Turner eventually seperated themselves from the pack, and raced side-by-side for much of the second half of the race, with Herron edging ahead to take his second win in a row. The race was slowed by a red flag when contact between several cars resulted in Dave Bailey’s #73 going upside down on the backstretch. Bailey emerged uninjured from his heavily-damaged machine. Cory Turner settled for second, with Mike Thorne barely ahead of Jack Myers for the third spot, and Lee Winger in 5th. Heat races for the 31 car field were claimed by Brett Rodwell, Chris Dickie, Brad Herron, and Cory Turner, while Rob Disher won the B-Main. Brian Crosgrove and Laura Hughes made up an all-rookie front row for the Mini Stock feature, but they were eventually overtaken by hard-charging Jeremy Hughes, and others. Jeremy’s #10j looked to be the car to beat, until his engine went south near the end of the race. Karl Sault drove through the field from the 8th row to get his first feature win of 2012, followed by Mark Czuba, Jason Lungaro, Robin Elliott, and Laura Hughes. The points standings received a shakeup when leader Mike Evers was involved in a crash early in the race, and did not finish. Heat races for the 33 car field were claimed by Brian Crosgrove, John Cote, Mark Czuba, and Karl Sault, while Doug Erskine won the B-Main. Mark Bazuin and Brady Longboat were front row starters for the Bomber feature, and Longboat took the lead in search of his first win. Jesse McDonald made his way to the runner-up spot, and traded the lead with Longboat several times before getting by for good. McDonald claimed his first win of the season, followed by Longboat, Jeremy May, Davey Boughton, and Max Chechalk. Heat race wins for the 12 car field went to Longboat and McDonald. The Rochester Knighthawks Lacrosse Club presents “Sunshine Foundation and Autograph Night” this Friday, July 6. The Corr/Pak Merchandising Sprint Cars, Lighthouse Tattoos Thunder Stocks, HRW Automotive Mini Stocks, and Pierced Parts Bombers are all part of round 6 of Friday Night Thunder on July 6, plus another visit by the Modified Lite Stars International Championship Tour. Gates open at 6:00 with racing starting at 7:45! Advanced reserved seat tickets for “Tony Stewart at Ohsweken” July 30, World of Outlaws Sprint Cars “Six Nations Showdown” July 31, and the 8th annual Canadian Sprint Car Nationals September 14 and 15 at Ohsweken are on sale now! 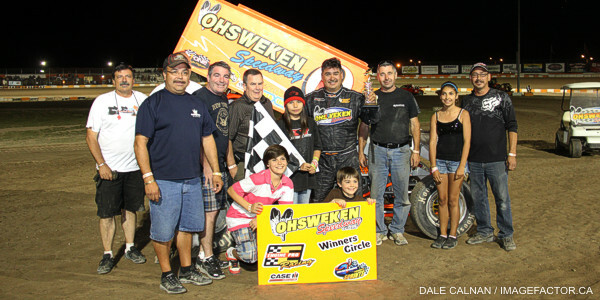 Please visit www.OhswekenSpeedway.com and call 1-888-720-RACE to order yours today! 1. 14h Jim Huppunen (Fenwick), 2. 71 Travis Cunningham (Grimsby), 3. 49 Todd Hoddick (Cheektowaga, NY), 4. 7x Jamie Collard (Burford), 5. 5 Keith Dempster (Alton), 6. 67 Chris Durand (Port Stanley), 7. 5c Conor Mahoney (Waterdown), 8. 15 Mike Ferrell (London). Time – 1:58.711. 1. 07x Dain Naida (Tecumseh, MI), 2. 5d Dave Dykstra (Port Colborne), 3. 10 Mitch Brown (Brantford), 4. 11 Jamie Turner (Caistor Centre), 5. 84 Tyler Rand (Consecon), 6. 11z Zach Zumpe (St. Catharines), 7. 31 John Burbridge, Jr. (St. Williams), 8. 40 Sammy Steiss (Ohsweken). No Time. 1. 0 Glenn Styres (Ohsweken), 2. 80 Chris Steele (Fenwick), 3. 27h Tom Huppunen (Fenwick), 4. 01 Mikey Kruchka (Hamilton), 5. 81 Derek Jonathan (Lewiston, NY), 6. 3r Shane Ross (Thedford), 7. 21j John Burbridge, Sr. (Simcoe). No Time. 1. 25 Michael Parent (Granby, QC), 2.  f37 Kyle Moffit (South Dayton, NY), 3. 90 James Evans (Beamsville), 4. 98 Paul Pekkonen (Brockville), 5. 30g Steve Goldner (Aylmer) DNF, 6. 52 Jesse Costa (St. Thomas) DNF, 7. 96 Shane Butler (St. Thomas) DNF. No Time. 1. 3r Shane Ross, 2. 81 Derek Jonathan, 3. 01 Mikey Kruchka, 4. 5 Keith Dempster, 5. 11z Zach Zumpe, 6. 5c Conor Mahoney, 7. 21j John Burbridge, Sr., 8. 31 John Burbridge, Jr., 9. 67 Chris Durand, 10. 40 Sammy Steiss, 11. 15 Mike Ferrell, DNS. 96 Shane Butler, DNS. 52 Jesse Costa, DNS. 30g Steve Goldner. Time – 2:32.544. 1. 71s Shawn Sliter (Port Colborne), 2. 1 Paul Klager (Beamsville), 3. 7s Dillan Sliter (Port Colborne), 4. 33 Korey Howe (St. Catharines), 5. 26 Ray Sliter, Jr. (Ridgeway), 6. 4 Greg Mills (Niagara Falls), 7. 9 Jared Turnbull (Paris) DNF, 8. 27 Rick Koabel (Port Colborne) DNF. No Time. 1. 77 Brett Rodwell (Caledonia), 2. 00x Derek Miller (Ohsweken), 3. 23 Trevor DeBoer (Caledonia), 4. 00 Robbie General (Ohsweken), 5. 3b Blaine Barrow (Welland), 6. 4 Brittany Gyokery (Jarvis), 7. 13 Kacey Huffman (Hamilton) DNF, 8. 29 Adam Gracey (Dunnville) DQ. 1. 1 Chris Dickie (Brantford), 2. 91 Ryan Turner (Caistor Centre), 3. 10 Jake Brown (Brantford), 4. 10x Richard Champigny (Welland), 5. 48 Shaun Quinn (Caledonia), 6. 68 Aaron Turkey (Ohsweken), 7. 191 Gord Bates (Selkirk), 8. 84rk Ryan Beagle (Vittoria). 1. 12 Brad Herron (Waterford), 2. 55 Mike Thorne (Caledonia), 3. 28 Jim Lampman (Caistor Centre), 4. 2 Lee Winger (Caledonia), 5. 38 Terry Martin (Ohsweken), 6. 17 Rob Disher (Grimsby), 7. 62 Brian Pescetti (Stoney Creek), 8. 333 Kameron Kocarik (Fonthill). 1. 33t Cory Turner (Caistor Centre), 2. 108 Curt Styres (Ohsweken), 3. 33m Jack Myers (Wainfleet), 4. 5h Devin Habiuk (Port Robinson), 5. 04 Wyatt Van Wart (Cambridge), 6. 73 Dave Bailey (Hagersville), 7. 24k Kyle Magrin (Hamilton). 1. 17 Rob Disher, 2. 73 Dave Bailey, 3. 191 Gord Bates, 4. 333 Kameron Kocarik, 5. 68 Aaron Turkey, 6. 84rk Ryan Beagle, 7. 4 Brittany Gyokery, 8. 24k Kyle Magrin, 9. 62 Brian Pescetti, DNS. 13 Kacey Huffman, DNS. 29 Adam Gracey. 1. 96 Brian Crosgrove (Hamilton), 2. 10 Laura Hughes (Flamboro), 3. 52 Kevin Ross (Mount Hope), 4. 12 Jonathan Ayrton (Hamilton), 5. 69 Rob Twitchett (Dundas), 6. 77x Ethan Martin (Ohsweken), 7. 11 Mike Giberson (Caledonia), 8. 92 Matt Pleil (Kitchener). 1. 38 John Cote (Hamilton), 2. 55 Rob Slater (Dundas), 3. 05 Dave Goodacre (Brantford), 4. 53 Sarah Rutherford (Dundas), 5. 84 Dale Gyokery (Jarvis), 6. 66 Jon Janssens (Woodstock), 7. 27 Ashton Reekie (Hamilton), 8. 7x Chase Hess (Ohsweken). 1. 02 Mark Czuba (Burlington), 2. 69e Dan Erskine (Caistor Centre), 3. 777x Steve Hess (Ohsweken), 4. 22 Brittani Myers (Hamilton), 5. 99 Robin Elliott (Woodstock), 6. 64 Doug Erskine (Hamilton), 7. 79 Steve Miller (Paris), 8. 5 Rick Robinson (Brantford). 1. 81 Karl Sault (Dundas), 2. 7 Jason Lungaro (Hamilton), 3. 10j Jeremy Hughes (Burlington), 4. 48 Craig Erskine (Brantford), 5. 265 Mike Evers (Caledonia), 6. 44 Dale Cooke (Hamilton), 7. 32 Glen Vandergeld (Cambridge), 8. 53x Rodney Rutherford (Waterdown), 9. 72 Kevin Hilborn (Brantford) DNF. 1. 64 Doug Erskine, 2. 44 Dale Cooke, 3. 72 Kevin Hilborn, 4. 53x Rodney Rutherford, 5. 79 Steve Miller, 6. 66 Jon Janssens, 7. 27 Ashton Reekie, 8. 92 Matt Pleil, 9. 11 Mike Giberson, 10. 32 Glen Vandergeld, 11. 7x Chase Hess DNF, DNS. 77x Ethan Martin, DNS. 5 Rick Robinson. 1. 66 Brady Longboat (Ohsweken), 2. 21 Mark Bazuin (Caledonia), 3. 16 Jeremy May (Hamilton), 4. 707 Danny Shantz (St. Agatha), 5. 18x Davey Boughton (Carlisle), 6. 42 Joe DeBoer (Hagersville), 7. 03d Dakota Potts (Waterford) DNS. 1. 88 Jesse McDonald (Caledonia), 2. 97 Max Chechalk (Hamilton), 3. 199 Frank Turkey (Ohsweken), 4. 23 Dusty DeBoer (Hagersville), 5. 5 Kathi Dickie (Brantford), 6. 44 Tylor Brock (Dunnville).